What kind of gloves should I wear during electrical work? I need to know which glove material is most suitable for this kind of work, as I wish to purchase the proper gloves. Depends on the voltage you're working with. If you're working in a residential setting, simply turn off the power and wear any type of glove you find comfortable (including none). If working in an industrial setting, where turning the power off is not an option. You'll have to choose a glove system based on the voltage you'll be working with. A glove system should always consist of an appropriate insulating glove, and a protective leather glove. 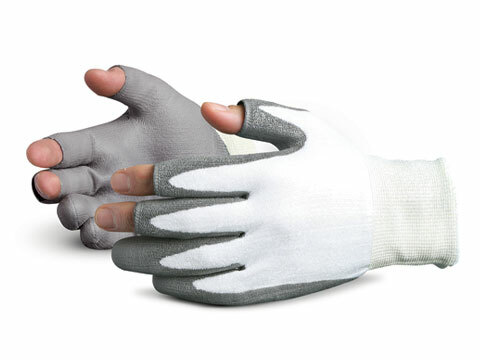 A glove liner is an optional part of the system, and can be worn depending on how dainty your hands are. Class 00 - Good for up to 500 volts. Class 0 - Up to 1,000 volts. Class 1 - Up to 7,500 volts. Class 2 - Up to 17,000 volts. Class 3 - Up to 26,500 volts. Class 4 - Up to 36,000 volts. WARNING: Always properly test your gloves before each use. Visual inspection and air testing is the most common method. If you're using these gloves, you've hopefully been trained how to care for and test them. If not, you probably shouldn't be doing anything that requires you to use them. Work bare-handed (I find it easier). Get a bulk pack of cheap mechanics gloves. Take a few pair and cut the fingers off until they look like these expensive ones. I cut all the fingers off, but be sure they still cover your second knuckle. That's about all they're for; to protect your knuckles against the sharp edges of J-boxes, and having a cover on your palm while you payout wire. Note, these only alleviate abrasions and in no way will they protect you from electrical hazards. You only need one glove to keep from having a fatal shock to your heart from one hand to the other unless you are standing in water on concrete or ground with conductive shoes. Any glove that protects against contact would help, but an cloth lined rubber glove could save you. However, if you ask this question, you are probably not qualified to do electrical work. Not the answer you're looking for? Browse other questions tagged electrical safety health-and-safety or ask your own question. Can you do electrical work yourself in the UK? How can I protect my hands when using power tools? What should be on my pre-purchase house self-inspection checklist? What kind of portable electric heater should I use in my kitchen? What is the relative importance of cut-retardant safety gloves when using a chainsaw? What kinds of gloves should be used for working with mortar? What electrical work can I do legally in New Brunswick, Canada?